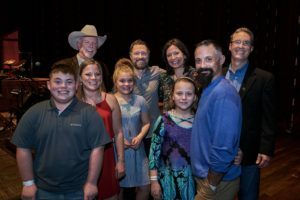 NASHVILLE, Tenn. (Feb. 27, 2018) – Country music entertainer, award-winning TV host and Army veteran Craig Morgan had a big surprise up his sleeve Friday (Feb. 23) at the Grand Ole Opry. During his performance, Morgan invited his long-time friend, U.S. Army SFC Josh Ferguson, a disabled veteran, and his family onto the stage and surprised them with the news they are receiving a custom-built, mortgage-free home this year in Dickson County (Tennessee) from Operation FINALLY HOME. Joining Morgan onstage for the surprise was Operation FINALLY HOME founder Dan Wallrath and Executive Director Rusty Carroll. Photo cutline: U.S. Army SFC Josh Ferguson (front right) and his family received a surprise of a lifetime Friday night at the Grand Ole Opry when Craig Morgan surprised them with the news they are receiving a new custom-built, mortgage-free home in Dickson County (Tennessee) from Operation FINALLY HOME. Joining Craig and the Ferguson family are Sally Williams, General Manager, Grand Ole Opry, and Operation FINALLY HOME Founder Dan Wallrath and Executive Director Rusty Carroll.